CAIRO, Egypt (CNN) -- U.S. Defense Secretary Robert Gates arrived in Cairo on Monday to begin a trip he hopes will allay Middle East countries' concerns about U.S. talks with Iran. 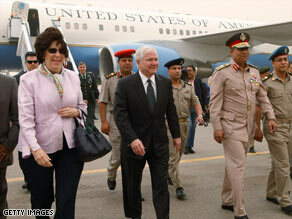 U.S. Defense Secretary Robert Gates arrives in Cairo, Egypt, on Monday. As he flew to Egypt, Gates outlined the message he's carrying. "I think that there's probably some concerns in the region ... that may draw on an exaggerated sense of what's possible," he said, "and I just think it's important to reassure our friends and allies in the region that while we are willing to reach out to the Iranians, as the president said, with an open hand, I think everybody in the administration from the president on down is pretty realistic, and will be pretty tough-minded if we still encounter a closed fist." Egypt has recently accused Iran of trying -- through its proxy group Hezbollah -- to destabilize President Hosni Mubarak's regime. The U.N. secretary-general recently expressed concern that Hezbollah was operating outside Lebanese territory and violating Egyptian sovereignty. Gates termed his visits to Egypt and Saudi Arabia as intended to "strengthen our relationship with longtime friends." He first visited Egypt 30 years ago, during a trip by President Jimmy Carter, and he met Mubarak in 1990 while preparing for the first Gulf War. This is Gates' first trip to the Middle East since President Obama took office. Gates was also defense secretary for the final two years of President George W. Bush's administration. Gates will meet with Mubarak before leaving for Saudi Arabia on Tuesday. The defense secretary said discussions during his trip could touch on Iraq and the concern some Arab states have with Iran's influence there. He will encourage more Gulf states to reach out to Iraq and become what he called "a counterbalance." He said he also plans to speak with the Saudis about repatriating some Yemeni detainees at the U.S. naval base at Guantanamo Bay, Cuba, through Saudi rehabilitation centers. "I think that will be one of the topics," Gates said. He said there are more Yemenis in Guantanamo than any other nationality, and the Saudis have the most successful rehabilitation re-education program. But asked if Yemen's president is any more open to letting more Yemenis go to Saudi Arabia for rehabilitation, he admitted, "not necessarily." Gates said part of his focus in Saudi Arabia will be on its potential influence in Pakistan. "I think that the Saudis in particular have considerable influence in Pakistan, and so I think whatever they can do to help bring the Pakistanis together in a broader sense to deal with the challenge to the government in Islamabad would be welcome," he said. Gates is coming to the Middle East as 21,000 more American troops prepare to head to Afghanistan. On that front, the defense secretary reiterated that the United States is open to some form of reconciliation with certain elements of the Taliban. But he said that as long as the Taliban perceives momentum on its side, "the prospects for political reconciliation are pretty limited. And when it comes, political reconciliation has to be on the terms of the Afghan government, which must have a monopoly on the armed force in that country."